Does time exist? Quantum physics says "No"
"We choose to examine a phenomenon which is impossible, absolutely impossible, to explain in any classical way, and which has in it the heart of quantum mechanics. In reality, it contains the only mystery." 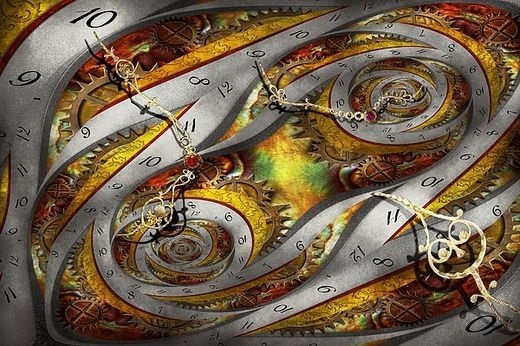 The concept of "time" is a weird one, and the world of quantum physics is even weirder. There is no shortage of observed phenomena which defy our understanding of logic, bringing into play thoughts, feelings, emotions - consciousness itself, and a post-materialist view of the universe. This fact is no better illustrated than by the classic double slit experiment, which has been used by physicists (repeatedly) to explore the role of consciousness and its role in shaping/affecting physical reality (source). The dominant role of a physical, material (Newtonian), universe was dropped the second quantum mechanics entered into the equation and shook up the very foundation of science, as it continues to do today. "I regard consciousness as fundamental. I regard matter as derivative from consciousness. We cannot get behind consciousness. Everything that we talk about, everything that we regard as existing, postulating consciousness." There is another groundbreaking, weird experiment that also has tremendous implications for understanding the nature of our reality, more specifically, the nature of what we call "time". It's known as the "delayed-choice" experiment, or "quantum eraser", and it can be considered a modified version of the double slit experiment. In this experiment, tiny bits of matter (photons, electrons, or any atomic-sized object) are shot towards a screen that has two slits in it. On the other side of the screen, a high tech video camera records where each photon lands. When scientists close one slit, the camera will show us an expected pattern, as seen in the video below. But when both slits are opened, an "interference pattern" emerges - they begin to act like waves. This doesn't mean that atomic objects are observed as a wave (even though it recently has been observed as a wave), they just act that way. It means that each photon individually goes through both slits at the same time and interferes with itself, but it also goes through one slit, and it goes through the other. Furthermore, it goes through neither of them. The single piece of matter becomes a "wave" of potentials, expressing itself in the form of multiple possibilities, and this is why we get the interference pattern. How can a single piece of matter exist and express itself in multiple states, without any physical properties, until it is "measured" or "observed"? Furthermore, how does it choose which path, out of multiple possibilities, it will take? Then, when an "observer" decides to measure and look at which slit the piece of matter goes through, the "wave" of potential paths collapses into one single path. The particle goes from becoming, again, a "wave" of potentials into one particle taking a single route. It's as if the particle knows it's being watched. The observer has some sort of effect on the behavior of the particle. This quantum uncertainty is defined as the ability "according to the quantum mechanic laws that govern subatomic affairs, of a particle like an electron to exist in a murky state of possibility — to be anywhere, everywhere or nowhere at all — until clicked into substantiality by a laboratory detector or an eyeball." According to physicist Andrew Truscott, lead researcher from a study published by the Australian National University, the experiment suggests that "reality does not exist unless we are looking at it". It suggests that we are living in a holographic-type of universe (source). Like the quantum double slit experiment, the delayed choice/quantum eraser has been demonstrated and repeated time and time again. For example, physicists at The Australian National University (ANU) have conducted John Wheeler's delayed-choice thought experiment: the findings were recently published in the journal Nature Physics. "If we attempt to attribute an objective meaning to the quantum state of a single system, curious paradoxes appear: quantum effects mimic not only instantaneous action-at-a-distance, but also, as seen here, the influence of future actions on past events, even after these events have been irrevocably recorded". The list literally goes on and on, and was first brought to the forefront by John Wheeler in 1978, which is why I am going to end this article with his explanation of the delayed choice experiment. He believed that this experiment was best explained on a cosmic scale. He asks us to imagine a star emitting a photon billions of years ago, heading in the direction of planet Earth. In between, there is a galaxy. As a result of what's known as "gravitational lensing", the light will have to bend around the galaxy in order to reach Earth, so it has to take one of two paths, go left or go right. Billions of years later, if one decides to set up an apparatus to "catch" the photon, the resulting pattern would be (as explained above in the double slit experiment) an interference pattern. This demonstrates that the photon took one way, and it took the other way. One could also choose to "peek" at the incoming photon, setting up a telescope on each side of the galaxy to determine which side the photon took to reach Earth. The very act of measuring or "watching" which way the photon comes in means it can only come in from one side. The pattern will no longer be an interference pattern representing multiple possibilities, but a single clump pattern showing "one" way. This makes absolutely no sense, which is a common phenomenon when it comes to quantum physics. Regardless of our inability to make sense of it, it's real. Time as we measure it and know it, doesn't really exist.